Most people don’t have any idea of what happens after the filming is done and everyone has returned to their regular schedules. For the editor, director and creative team, the work now begins on a less than glamorous side of documentary production. For me this is an extension of the creative process and I am always anxious to get that part started., however there is some “chores” that have to be completed. 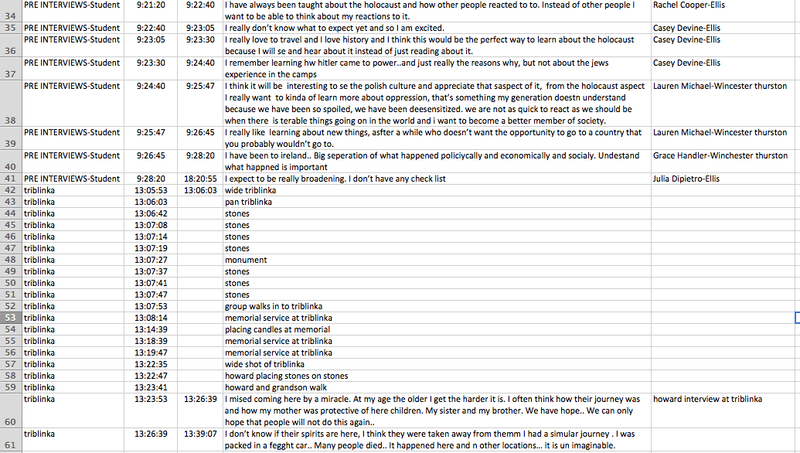 The first of those is the logging of the video. Ideally it would have been nice to do that while on the road, but the way the days are constructed and work is scheduled, that rarely happens. I have developed a series of workflows that enable me to be productive and save time. 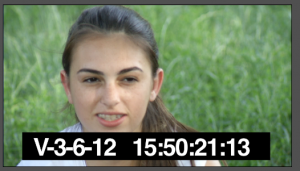 I first take all the interviews and spoken pieces and place them into a small video with timecode burn. This enables me to watch, listen and log into a spreadsheet while iI am not attached to the big external hard drive. So I would be sitting in my favorite camping chair, in the deep woods, and be logging my sound bytes. 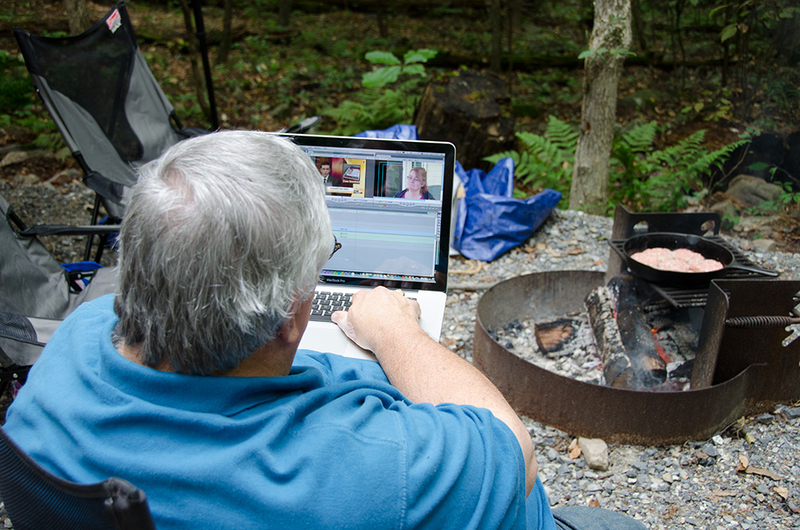 (Sausage for breakfast on the grill) Now this defeats the reason why I go to the woods, but it also offers me a time to do both relaxing and being creative. I don’t spend a lot of time with the technology while in the woods however there are times when scheduled work completion makes that use of rest time-work time. I use a simple Excel spreadsheet with several columns. Location, start time, end time, length, text or some people call it “verbatim,” and the last column, subject name. The length of each sound byte is calculated with a simple formula that subtracts the start time from the end time. 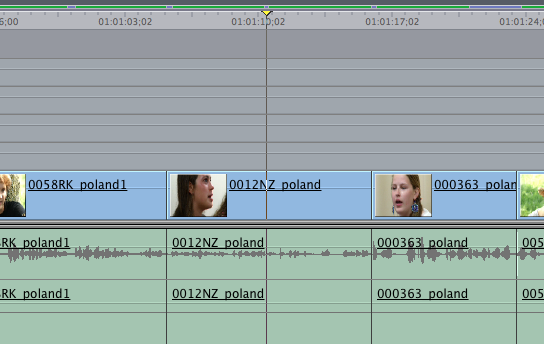 When entering the timecode, I skip the frames, since this is not a music video or something that needs frame accuracy. I just skip the frame numbers. 01:24:15 translates to one hour-twenty four minutes-fifteen seconds. This process can become tedious but I have found that later in the edit and even years later, the process justifies itself. Once all the logging is complete, I also have a better idea of what the story might be. I might even put a asterisk in the last column to indicate here is the good stuff. 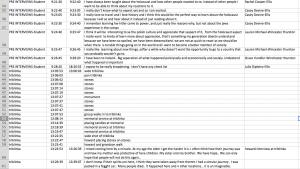 I will breakdown the segments into sections according to an outline of what I think each segment should be about. Then I can assemble those segments into what some call a “radio edit” since it is not really about the visual but about the audio. I will leave the video attached to the audio for easy use of the person talking to be included in the visual. I try and stay away from a lot of “talking head” shots. However, I think the viewer needs to be connected to the voice, especially for emotional segments. At this point I have the narration voice over recorded, if not by the voice over talent, by me. This serves as a placeholder for replacement when the script is finalized and the voiceover work is recorded. 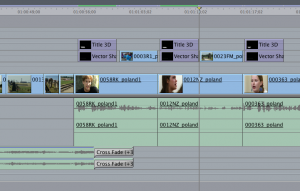 After all the pieces have been assembled on the timeline then the process of evaluating the film begins. At this point no extra video has been added to cover the talking head or the narration, no music or sound effects have been added. That process begins in the next step. This is the step I am presently working on. 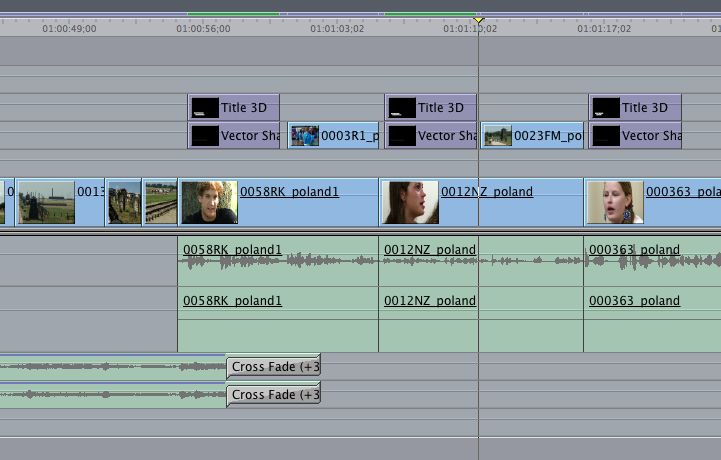 Adding the video, music and effects to the film. I may also be working on the opening and closing credits while this process is in place. 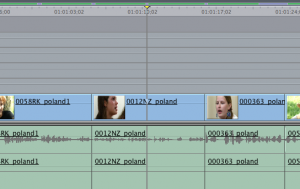 This is the creative part that I really enjoy, making it look and sound good. The story is in place, the theme is set and now it is time to add the punches that will make this a finished film. I say this is the most creative but it would be more accurate to say this is the largest part of the creative. The whole editing process is a creative exercise and since I am also the director as well as editor, I have the freedom to be as creative as my little mind permits. So for now, it is back to the computer and the process. This entry was posted in Opening Thoughts. Bookmark the permalink.